As you implement your program, you will want to regularly assess the efficiency of your operations and the effectiveness of your strategies and tactics in leading you to meet your program goals. Continuous improvement may involve making small adjustments in your internal processes. It may also mean refining your original program design and revisiting aspects of your implementation plan, as well as adapting the program to new needs and opportunities in the market. Although this ongoing assessment and improvement is related to formal process evaluation, it is distinct in that it is ongoing, less formal, and generally done as part of ongoing internal program management. To effectively assess and improve your program, you need to build in systems and processes to collect information, review it, and make decisions about program refinements. 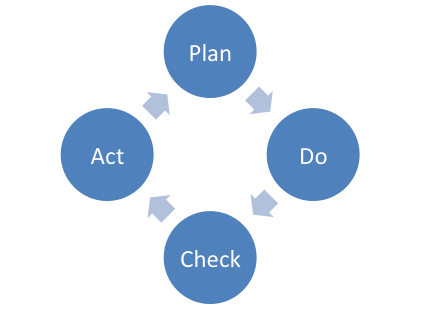 A common and useful structure for describing this process of continuous improvement is the Plan-Do-Check-Act Cycle shown below. Plan. For your initial program launch and ongoing operation, develop your implementation plan. Over time, update or implement plans for refining your program, following decisions to make changes. Do. Launch, then implement your program on an ongoing basis. Check. Assess how your program is working, including any new approaches you have implemented. Through a conscious effort of information collection and review, look for trends and patterns that inform adjustments to program design and operational processes. Use resources such as program dashboards, data reports and other resources that help you track and communicate program performance. This step in the Plan-Do-Check-Act Cycle is the main focus of this handbook. Act. Make decisions about program refinements and communicate them to all relevant program staff and partners. The cycle then continues with planning how to undertake refinements (“plan” step), implementing these refinements (“do” step), assessing them (“check” step), and making further decisions about program refinement (“act” step). As you go through this continuous improvement process, you will collect and assess information from all program components as inputs to program decisions, including Marketing and Outreach, Financing, and Contractor Engagement & Workforce Development. Electronic program management dashboards and/or regular reports (e.g., on program metrics, customer feedback, quality assurance) will help you quickly synthesize this information. Manage your program by assimilating all of this information, identifying opportunities for improvement, assessing the potential positive and negative impacts of any changes you might want to make, and deciding on a course of action. You will also want to communicate major program design decisions to staff, partners, and stakeholders before implementing changes. Make decisions about program design and implementation changes and communicate them. The U.S. Department of Energy (DOE) administered the Better Buildings Neighborhood Program (BBNP) to support programs marketing and conducting whole building energy upgrades. DOE provided grant funding through this program from 2010 to 2013 to energy efficiency programs throughout the United States. To understand the program’s success, DOE worked with third-parties to undergo a comprehensive impact, process, and market effects evaluation. For more on the evaluation, see the Better Buildings Neighborhood Program Accomplishments. There are several steps that will help you assess and improve your program. Program and customer metrics, discussed in the Develop Evaluation Plans handbook for Program Design; the handbook describes key program and customer metrics that can be used to measure program impacts and the effectiveness of your program delivery process. In addition, the handbooks for Marketing and Outreach, Financing, and Contractor Engagement & Workforce Development describe similar types of metrics for tracking those components of the program. These metrics are not only useful for program evaluation but also for tracking and systematic review on an ongoing basis. Dashboards, reports, and other methods of review are described in the next step of this handbook. In addition to quantitative information about program accomplishments and customers, you should collect and use qualitative information about your program, including those described below. For more on collecting information from customers, see the handbook on developing program metrics for evaluation plans. Contractor feedback. As with customers, you can survey contractors. Many programs also establish ongoing interactions with contractors to get their feedback on program processes and strategies. More information on contractor feedback can be found in the handbook on assessing and improving strategies for contractor engagement & workforce development. Feedback from partners. Your partners can be an excellent source of feedback about your program based on their interactions with you as well as their ongoing interactions with customers, contractors, and others. Many programs establish advisory committees or other mechanisms for getting feedback directly from partners. More information on getting feedback from specific partners can be found in handbooks on marketing & outreach, financing, and contractor engagement & workforce development. Customer satisfaction is critical to a successful program. Customers who are not satisfied may drop out of the process before they conduct an upgrade, and they certainly will not bring more customers to your program by word of mouth to neighbors, friends, and family. There are many causes of customer satisfaction and dissatisfaction, and using multiple methods to get feedback can help you understand these causes and where there may be opportunities to improve. Actively seek out information from your customers through your website, call centers, and contractor conversations, and by making your program’s email contact information and phone number easily available. Note that these strategies can be used to get feedback from contractors and partners as well. Let customers know you want their feedback and ask them for it directly. For example, Efficiency Maine called all of the participants in its residential direct install program to gauge satisfaction and see if these customers were interested in moving forward with additional measures identified in home assessments. Open-ended questions about overall satisfaction with the program and opportunities for improvement. Surveying customers who did not successfully complete the program. Surveying these program drop-outs will help you find opportunities to improve and identify process failure points that need special attention. DOE has developed a phone-based survey example for program drop-outs. Focus groups. Assembling focus groups or panels of customers can help you test and refine program delivery strategies and techniques. Focus groups work best when you are seeking specific feedback—for example, about the effectiveness of a marketing message or customer interest in a new program service. Focus groups can provide you with relatively rapid feedback from a cross-section of customers that will save you the time and frustration of trying out a new untested strategy on your customers. Call center information. Call centers can be very effective at drawing out useful feedback, especially information that customers may not think to put in a survey. Standardized templates or forms for call center staff can help record and communicate key feedback to the program team. Put yourself in your customer’s shoes. Have staff walk through the process as if they were a customer, and assess how the process would work for them. Better yet, encourage staff to actually go through an assessment and upgrade process themselves to experience the process from the customer's perspective. Enhabit, formerly Clean Energy Works Oregon, established an extensive process for getting customer feedback at key points in the program delivery process to judge customer satisfaction and understand why some homeowners chose to undertake upgrades while others did not. Experience after 12 months—asking about satisfaction with the project and program 12 months after the upgrade. Information from the assessment informed the design of the program as it broadened its geographic reach throughout Oregon. While it is important to gather survey data, do not give your customers “survey exhaustion.” Make sure you are not asking too much of your customers and make sure that you have a plan to use all of the information you are collecting. “Please rate your experience with your contractor” (from “1” for very poor to “10” for excellent). The survey also asked about areas where services could be improved, and it inquired about next steps homeowners planned to take. Program staff members were able to access updated survey responses on a weekly basis, including summary graphs of results that illustrate trends in satisfaction. Among other things, the surveys helped the program modify the assessment report provided to each homeowner, reducing it from 20 pages of detailed building science information to three pages of key data, the top five recommendations for upgrades, and information about next steps. For more about EnergySmart’s approach to customer surveys and tracking customer data, see the presentation “Using Data to Monitor Market Transformation”. Metrics on work flows help you assess how smoothly the assessment and upgrade process is working. Having many customers moving smoothly through the process is a strong indicator that processes are not just working well for customers—but also for the contractors and lenders with whom they are interacting. Programs often collect data for metrics through project tracking systems, which are described in further detail in the Develop Resources handbook. These systems are helpful for ongoing monitoring and program improvement. For example, Seattle’s Community Power Works has a web-based information system that program administrators use to track the number of projects at several key steps and the time it takes for customers to move from one stage of the assessment and upgrade process to the next. The system also allows homeowners to keep track of their project status through a customer portal. Metrics are particularly helpful for tracking progress toward your objectives by measuring not only completed projects, but also the intermediate achievements that indicate whether or not you are being successful even before all of the completed upgrades have been counted. You can think of these as anticipatory metrics. In economic terms, they are similar to a “leading indicator,” a metric whose change usually anticipates a change in direction in the economy. In program management terms, anticipatory metrics can help predict final results. They are anticipatory because they can be measured before results (e.g., number of upgrades completed). Over time, you can keep track of how well these anticipatory metrics serve your needs by seeing how well they correlate with your results. If your program requires a comprehensive assessment as part of the upgrade process, the number of assessments completed could be an anticipatory metric for your program. Identify anticipatory metrics by understanding the relationship between steps. If your objective is 100 completed upgrades, you know that at least 100 assessments need to be done. Realistically you know that most programs will need at least two to three times that number of assessments because only a portion of customers will complete an upgrade project. Track anticipatory metrics. If you keep track of the number of assessments that are done, you can use that information to help predict how close you may be to being able to meet your 100 upgrade objective. Use information about timing to anticipate trends in program activity. If you know how long it takes on average to complete an upgrade after the assessment has been completed, you can understand when spikes or lulls in upgrades may occur—and you can predict whether and when you will meet your objectives. Average age of completed upgrade (from home performance assessment). For more about the Neighbor to Neighbor Energy Challenge's approach to data collection and program assessments, see the presentation “Technology Solutions and Programmatic Approaches: Driving Innovation in Residential Energy Efficiency Strategies”. While it is vital that your program measure program progress, customer satisfaction, and the efficiency of your workflows, you also need to track your internal operational budget to ensure that you are investing your funds sufficiently to get the results you want—and also to ensure that you are not spending beyond your means. Budget information helps programs track costs against overall budgets and find opportunities to reduce costs or increase investments. Capital expenses (e.g., equipment, computers and software). Overall spending relative to project outcomes (e.g., number of upgrades, energy savings). As you collect information about your program, establish internal mechanisms for communicating and reviewing information that can support real-time assessment of program performance as well as mechanisms for communicating information externally. Communicating program metrics and component-specific metrics related to marketing and outreach, financing, and contractor engagement & workforce development allows program personnel and partners to monitor activity, understand progress toward goals, and assess and improve program design and delivery over time. Design communication tools to present information in a format that highlights key data, trends, and analysis. Some data are best expressed as numbers reflecting magnitude (e.g., total energy savings). Others are better expressed as relationships such as percentages or ratios (e.g., percent achievement of numeric objectives or cost per upgrade). Trend information is useful for some information (e.g., upgrades over time). Where possible, highlight progress toward specific goals and objectives. These approaches will help program managers and partners quickly review information (i.e., the “check” step of the continuous improvement process) and make decisions about program refinements (i.e., the “act” step). Who. Determine who should get what type of internal information (e.g., program staff, contractors). When. Determine how often information should be generated and communicated (e.g., monthly, quarterly, semi-annually). What. Determine what information should be communicated (e.g., metrics on upgrades, energy savings). How. Determine how metrics should be communicated (e.g., by reporting period, year-to-date, program-to-date). Common approaches for sharing program data are described below. Time series data showing, for example, how outreach, events, services offerings, operational changes and other factors are influencing program outcomes and the flow of projects. It is important to note that dashboards are only as good as the data they present—current and accurate data are critical for your program. RePower Bainbridge used a program dashboard, shown below, to track its progress on a monthly basis toward assessment, upgrade, energy savings, and carbon reduction goals. Source: Progress Dashboard, RePower Bainbridge, 2013. Regular written reports are another common strategy for sharing program information. These reports do not require special software systems but often use a standard template. Some programs produce monthly management reports showing key program metrics and budget data. Such reports are often circulated to program staff and the management team prior to monthly program meetings. Status updates on metrics for key program components: financing, marketing and driving demand, workforce, and data & evaluation. These internal reports can be adapted to the specific needs of a program. Some programs have used them to track leads generated by different outreach events, program activity by outreach staff member, referrals of customers to other programs, contractors attending training, and a variety of other data points. Share program data with key partners as part of ongoing communications, coordination, and consultation about efforts to assess and improve programs. For specific strategies for communicating these data to partners, see handbooks on Contractor Engagement & Workforce Development, Financing, and Marketing and Outreach. The Community Power Works (CPW) program in Seattle, WA used a program dashboard and custom reports, charts, and maps to track progress against targets. Several examples are provided below. CPW’s monthly indicators dashboard showed progress toward goals for sign-ups with the program, energy assessments, home energy upgrades, and energy savings. CPW used the program pipeline chart below to review the long-term progress of CPW customers by stage. The chart below represents data from 2011-2015. CPW used the premises map below to review where CPW sign-ups occurred over time. Potential customers could set the map for any given period (below is April 2011-May 2015) and zoom in or out to adjust the level of detail. In this way, homeowners could see if their neighbors were improving the energy efficiency of their homes. Your program may also want to generate routine reports for partners, funders, and others to maintain ongoing support for program implementation, provide accountability, and/or get feedback on program implementation. Funders may be interested in reports that clearly show the metrics of immediate relevance to them (e.g., kilowatt-hour or therm energy savings, demographic information, non-energy benefits). This reporting can help sustain funder support and/or provide an opportunity for feedback on program strategy and results. Similarly, you may want to provide routine reports to legislatures, city councils, and other decision-making bodies to show the benefits of public investments and get feedback on what kind of impacts in the community would help encourage future support. By tracking program operations closely, you will be able to identify issues that arise, make necessary changes, and respond quickly (i.e., the “act” step of the continuous improvement process). When developing program metrics and measurement strategies, you assigned responsibilities for reviewing and assessing evaluation metrics. Many programs use a monthly or twice-monthly management team meeting (coupled with frequent informal communications) for reviewing program data to inform design and operational decisions. Review and assessment should draw on all of the information sources described above as well as insights from other program components, including Marketing and Outreach, Financing, and Contractor Engagement & Workforce Development. Where the program is and is not meeting its goals. For example, if energy savings from upgrades are significantly off target, focus on determining why and develop strategies to address the problem. You could look at opportunities to target high-energy-use households or revisit your program’s incentive structure to encourage measures that deliver deeper energy savings. Process bottlenecks and failure points where the program may be losing customers. You should seek opportunities to streamline program steps that turn out to be more time-consuming or onerous than necessary. Look for chances to eliminate extraneous processes and procedures not critical for achieving program goals. Assess whether bottlenecks can be addressed with a technology solution (e.g., tablets for contractors to automatically transfer data from the field, electronic transfer of utility data upon customer release) or whether they need to be addressed through new staff roles, responsibilities, or procedures. Where customers, contractors, or partners are highly satisfied or dissatisfied. Understand what aspects of the process customers, contractors, and partners are satisfied or dissatisfied with and why. Seek advice from them about how to sustain and enhance the positive aspects of your program and how to address areas that are not working well. The Connecticut Neighbor to Neighbor Energy Challenge used extensive quantitative and qualitative data collection to assess its program delivery process, from initial outreach strategies in 14 towns around the state through assessments to upgrades. This approach identified several areas for improvement. Quantitative data were supplemented by qualitative information from customer surveys conducted online and by phone, and from staff debriefs following customer events. Data were used to develop management reports comparing metrics against weekly, monthly, and quarterly goals across multiple strategies. Program administrators used a dashboard to view high-level metrics and issued more detailed pipeline reports (measuring project-level data) for contractors. The program also shared progress reports with utility ratepayer fund administrators that oversaw program funding. Poor-quality leads at program launch. Feedback from contractors, customer surveys, and data on how many projects resulted in assessments and upgrades highlighted that only about a quarter of customers interested in the program (i.e., “leads”) actually followed through with an assessment (the program tracked the lead-to-assessment ratio as a metric called the “close rate”). To address the issue, the program engaged in intensive retraining of outreach staff, developed contractor scorecards, and made other program changes that led to an increase in the close rate to 60%. Low assessment-to-upgrade conversation rate. Project pipeline reports revealed that the number of customers moving from assessments to upgrades was low. To address the issue, the program created a contractor liaison position to interact directly with contractors and understand their bid and sales process, instituted a publicly available contractor scorecard, and held monthly contractor meetings to discuss what was working well and what was not. The program also created a “swim lane” strategy, in which program staff determined which customers were already interested in upgrades and which were mainly interested in home assessments. Customers already interested in upgrades were matched with contractors experienced in doing upgrade work. Customers mainly interested in assessments were matched with contractors experienced in home assessments that could help homeowners identify what kind of residential energy efficiency measures would be most appropriate for them. For more about the Neighbor to Neighbor Energy Challenge approach to data collection and program assessments, see the presentation “Technology Solutions and Programmatic Approaches: Driving Innovation in Residential Energy Efficiency Strategies”. Residential energy efficiency programs in San Diego, Seattle, and Oregon maintained active lines of communication with their contractors to get feedback and assess how well the programs were working for contractors. In all three cases, contractors suggested an improvement: provide contractors with incremental “progress payments” throughout upgrade projects rather than a single payment at the end of the project. Progress payments would allow contractors to buy materials and cover other expenses incurred early in a project. Because contracting companies are often small businesses, they often do not have a large amount of capital to cover costs that are repaid only at the end of a project. In response to the feedback from contractors, all three programs implemented changes. San Diego’s Energy Upgrade California program established progress payments as part of its financing approach. Seattle’s Community Power Works and Enhabit set up small revolving lines of credit to cover up to a 50% down payment on upgrade project costs. All three programs established rules for who would repay the funds if the project was not completed homeowners in San Diego and contractors in Seattle and Portland. In the “act” step of the Plan-Do-Check-Act Cycle, program managers—often in collaboration with staff and partners—make decisions about program design and operational changes. For programs to be flexible and embrace change, an entrepreneurial approach is required for program managers and staff. DOE’s experience with the Better Buildings Neighborhood Program has shown that programs that quickly adjusted to changing conditions tended to be more successful. At the same time, programs need to be judicious about when to make changes—frequent adjustments can confuse customers and frustrate contractors. You should also understand how much leeway your program has to make changes. For example, utility-run programs may need regulatory approval for program design changes. Establish clear lines of communication among program staff, contractors, and partners. The Denver Energy Challenge began serving customers in 2011. By September 2011, 2,100 residents had signed up, but only 100 undertook assessments and none moved on to upgrades. In the fall of 2011, the program re-assessed and committed to improving its results. The Challenge launched several new features, including having green teams consisting of outreach staff canvass neighborhoods. By the following summer (July 2012), residents had completed over 1,000 upgrades. The Green Jobs–Green New York program run by the New York State Energy Research and Development Authority (NYSERDA) found that lower income residents who most needed financial support were not qualifying for loans to complete upgrades. As a result, NYSERDA adjusted its financing program to establish two tiers of loans. Tier 1 loans followed traditional underwriting standards, establishing a minimum FICO credit score of 640 and a maximum debt to income (DTI) ratio of 50%. Tier 1 loans were financed through capital markets. Tier 2 loans used alternate underwriting criteria that were easier to achieve for lower-income residents. These loans were financed by a revolving loan fund managed by NYSERDA. For households with credit scores below 640, NYSERDA Tier 2 standards increased the maximum DTI to 55% and used utility bill repayment history in lieu of credit score to assess creditworthiness. For households with FICO scores above 680 that were rejected from Tier One because they had DTI ratios above 50%, Tier 2 standards increased the maximum DTI to 70% and used utility bill repayment history to assess creditworthiness. To be eligible for Tier 2 loans, homeowners also needed to be current on their mortgage payments for the previous twelve months. The program revised the Tier 2 criteria three times—what it described as “gradually lowering the bar”—based on loan application approval/denial rates. As of December 2013, the approval rate for Tier 2 loans was as high as 77%. As of December 2013, with nearly $44 million in total Tier 1 and Tier 2 loans issued, the delinquency rate was slightly higher for Tier 2 than Tier 1, but the total delinquency rate was only 3.6%. Among other things, the program learned that utility bill repayment history was a strong indicator of whether customers would repay loans. Source: Green Jobs—Green New York, 2014. Given all of the other things that compete for your audience’s attention, it is critical that program participation steps are straightforward and easy to understand. Many programs have found that complexity makes it harder for interested homeowners to complete upgrade projects. These programs have focused on streamlining services, requiring as few steps as possible for customers, and keeping the message about the upgrade process simple. Enhabit, formerly Clean Energy Works Oregon, provided a “One-Stop Shop” Home Energy Remodel process to guide customers through a four-step process: apply, assess, finance, and transform. This simple process gave customers access to a comprehensive package of services that included low-interest financing and rebates, free energy assessments, assistance from an independent energy advisor, and the option to repay monthly loan obligations through their heating utility bills. To keep the process simple for customers and, in the process, improve program administration efficiency, Enhabit focused on process automation through its internal project tracking system. The EnergySmart program in Boulder County, Colorado, found that having an energy advisor assigned to each program participant throughout the home upgrade process was a key to keeping the program simple for customers and for overall program success. Energy advisors offered easily accessible subject-matter expertise, project management support, and encouragement to help customers make decisions and complete their upgrades. They installed low-cost energy savings measures and helped homeowners review assessment reports, determine which home improvements to pursue, select contractors, and apply for rebates and financial incentives. EnergySmart enjoyed a robust conversion ratio; nearly 70 percent of enrolled homeowners completed a home energy upgrade. For more on energy advisors, see Energy Advisors: Improving Customer Experience and Efficiency Program Outcomes. Recognizing that many different types of energy efficiency financing and rebates were available to its customers—but that it could be overwhelming to sort through them all— RePower Bainbridge helped customers access aggregated information by creating a consumer-friendly guide to all utility and non-utility incentives in its service area. The local utility benefited from the guide as well—it made the guide available to all of its customers. Successful residential energy efficiency programs strive to set requirements for high-quality home energy upgrades and streamline processes to facilitate contractor participation. Balancing these two essential elements can minimize the burden on contractors and help the program maintain a consistent pool of qualified professionals. Satisfied contractors are a key to satisfied customers and successful programs. To reduce contractors’ reporting costs and enable timely and complete reporting, programs have streamlined contractor reporting forms while still collecting the necessary information for program operations. Most programs also avoid making contractors meet locally-specific certification requirements, instead requiring certification from nationally recognized programs. Many have found that soliciting ongoing feedback from contractors and communicating early about new offerings and potential changes allows for contractors to have a voice in the program’s design, and therefore a greater investment in its outcome. For more on working effectively with contractors, see the Contractor Engagement and Workforce Development handbooks. Long Island Green Homes began consulting with contractors during program design and continued to do so as the program launched. The program made it a priority to engage with a core group of trusted contractors when rolling out program changes, asking them about their needs, concerns, and current state of business. In this way, the program ensured that program offerings were adding value for the home performance industry and that program requirements were manageable for contractors. NeighborWorks of Western Vermont focused on listening to the needs, wants, and issues of contractors, so the program could help them serve customers most effectively. The NeighborWorks program held individual monthly meetings with each contractor to review client status, as well as bi-weekly group contractor meetings to review program issues, alert contractors to any changes in the program, and provide learning opportunities. Enhabit, formerly Clean Energy Works Oregon, has been very successful in engaging contractors in regular, ongoing communication and making adjustments to the program in response to contractor feedback. For example, when Enhabit engaged a new financing partner, the program asked contractors to examine the loan product and approval process. Leadership of the Home Performance Contractors Guild of Oregon, an organization that provided a unified voice and formal role for program contractors, identified that the timing of loan signings came too late in the contractor sales process. The guild said the financing product would not be of much use to contractors because contractors would have to expend considerable effort in a project before knowing if their customer could get a loan to pay for it. As a result, Enhabit renegotiated with the financing partner to put the loan signing earlier in the sales process. For more information, see the case study Making the Program Work for Contractors. This case study describes Austin Energy's short-term, comprehensive rebate/financing offer to jump-start participation and valuable lessons learned along the way. This case study describes an innovative program design used by BetterBuildings for Michigan to "sweep" neighborhoods in order to effectively reach its residential audience and achieve an 80% participation rate among those canvassed. Quick summaries of strategies various programs have used to improve the efficiency of delivering efficiency. This presentation discusses how Energy Upgrade California streamlined its program through improvements in its HPXML and IT software. As part of its "intentional learning" process, Charleston WISE collects information from homeowners that helps the program systematically test assumptions and implement continuous improvement. Overview of Michigan Saves' employer outreach initiative to drive uptake of home energy upgrades. Homeowner data collection survey created by RePower. The Community Power Works program in Seattle, WA uses a program dashboard to track progress against targets. This is an example dashboard from March 2015, which is updated on a monthly basis with progress toward goals for sign-ups, energy audits, home energy upgrades, and energy savings. This simple paper-based dashboard template is a useful tool for developing internal and external reports for communicating on a regular basis key program activities and accomplishments. Short survey for Connecticut's Neighbor to Neighbor Energy Challenge workshop participants. The workshop allowed the program to share its energy efficiency offerings with homeowners. Achieving energy savings goals and improving customer and contractor satisfaction while staying cost-effective makes managing home energy upgrade programs challenging. DOE's Home Upgrade Program Accelerator is working with program administrators to identify strategies that overcome challenges and achieve better results. The Arizona Home Performance with ENERGY STAR program completed process improvements that improved contractor satisfaction and deceased quality assurance labor. Build It Green implemented software improvements to their utility program's online rebate applications portal to accelerate data processing. This guide is designed to help environmental agencies better understand the array of Lean methods and when to consider using each method. The guide focuses primarily on Lean production, which is an organizational improvement philosophy and set of methods that originated in manufacturing but has been expanded to government and service sectors.